the stuff were available all the time answering our call and taking care of us. It a great place for family, the atmosphere is amazing, pool is big and clean and house is super clean as well. The surrounding is great. Really enjoyed it. Very secure, comfortable, beautiful complex of houses with very big and nice swimming pool. Perfect for a family for a lot fun. Area was perfect and sooo beautiful. Very Nice appartement. Situation géographique, Appartement assez spacieux, Espaces verts, Calme, L’accueil et la disponibilité de Mr Said. Très bon rapport qualité/ prix. One of our best sellers in Marrakesh! 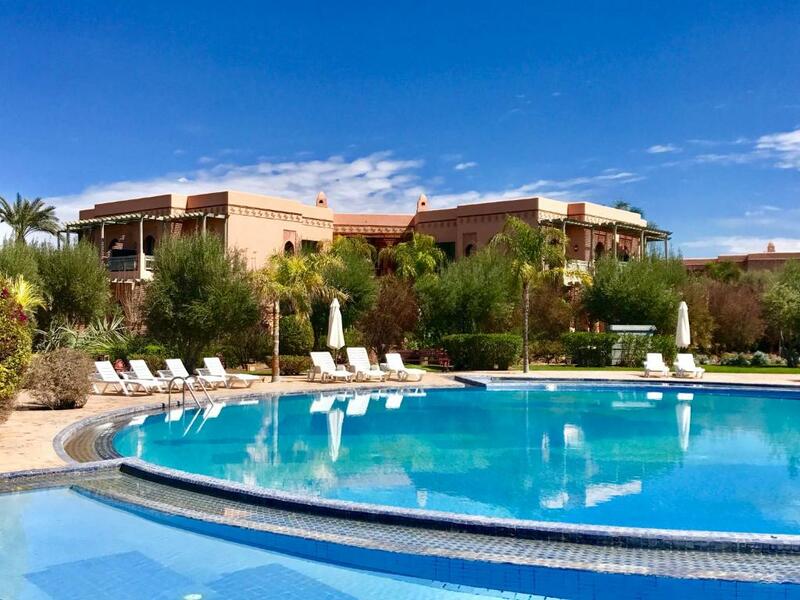 Set in Marrakech, Sabor Appartements Palmeraie is 3.7 mi from Majorelle Gardens. There is a restaurant and guests can have fun at the bowling alley. Medersa Ben Youssef is 3.7 mi away. Free private parking is available on site. All units feature a seating and dining area. There is also a kitchen, equipped with a microwave and toaster. A refrigerator is also featured, as well as a coffee machine and a kettle. Each unit features a private bathroom with bath robes and free toiletries. Towels are provided. Sabor Appartements Palmeraie also includes an outdoor pool. You can play tennis at the property, and free use of bicycles is available. You can engage in various activities, such as golfing and horse riding. Marrakech Museum is 3.7 mi from Sabor Appartements Palmeraie. The nearest airport is Marrakech-Menara Airport, 6.8 mi from the property. When would you like to stay at Sabor Appartements Palmeraie? This apartment features a bathrobe, seating area and microwave. Hosted by SABOR SERVICES S.A.
SABOR Travels provides you the opportunity to personalize your journey and travel easily. We provide you transportation, accommodation, activities for all family and the best guided and private tours around Morocco. SABORSERVICES SA, was founded in 2005 by Mr. Sabor Badr. The Company was established within the shared belief that a trip must be easily adaptable and customizable to each traveller, therefore, SABOR Services offer each explorer the opportunity to book all the elements of a journey together. Au cœur du ressort, des appartements haut de gamme offrent un confort inédit dans un cadre magique autour de piscines animées, de restaurants et d'activités de sports et loisirs. Les résidences sont conçues, sans séparation physique, essentiellement en un rez-de chaussée et un étage afin de respecter l'harmonie des palmiers. L'architecture des résidences des jardins de la palmeraie a l'élégance discrète des bâtiments, qui, grâce à l'harmonie de leurs proportions, se fondent naturellement au paysage. Agencés de manière à tirer le meilleur parti de l'espace et de la lumière, les appartements se prolongent d'une terrasse ombragée d'où il fait bon admirer les couchers de soleil. La noblesse des matériaux utilisés, l'extrême soin apporté aux finitions, l'alliage de décoration traditionnelle et de confort ultra-moderne, font de ces appartements un havre de beauté et de sérénité. House Rules Sabor Appartements Palmeraie takes special requests – add in the next step! Sabor Appartements Palmeraie accepts these cards and reserves the right to temporarily hold an amount prior to arrival. Please note that this property does not accept bookings from single men. Please note that property does not accept bookings from non-married couples. Please inform Sabor Appartements Palmeraie of your expected arrival time in advance. You can use the Special Requests box when booking, or contact the property directly using the contact details in your confirmation. There is no reception. We had to wait for a long time before collecting the keys (about 40 minutes). There was a water shortage and we had to call many times so that they come and fix it. Also, we received an email that the booking was cancelled. In fact, we did stay in the apartment. Even though we booked and paid online, the host asked us to pay cash as this is the policy for any booking the same day! I have used Booking.com many times and I have never heard about this policy! This was very inconvenient for us as we had to drive a long way to find an atm! Other comments: - There is no microwave or toaster. Only an oven and few dishes. - There is no restaurant - There is no soap at the washroom - There is no barbecue - There are no cleaning products - There are no toiletries as indicated. Only towels and toilet paper were provided. - There is no coffee machine. - There is no children high chair as indicated! - There was no internet. We had to wait for an hour until they brought the internet device. Overall, this was the worst experience I had after few years booking through Booking.com. This was supposed to be a nice gift for my family. However it ended up being a bad experience. Please check the properties before adding then to your website. Thank you and wish you all the best. Further away from Marrakech centre with long narrow road to reach and lack of signs for direction. This property is managed by Sabor Travel and they seem to be operating illegally in Morocco. They tried to not provide a receipt. I had to ask for it 3 different times. They did not answer their phone after I paid them to help me solve a large problem. We stayed in apartment 18-3. Two of the 3 sliding glass doors on this ground level apartment would not lock. I messaged the property and they did not respond. Only when I started sending messages through your messenger agent on booking.com did they begin to respond. They are totally unprofessional. They stated that they would provide a dryer machine (for drying clothes), bath robes, and sheets. They did not provide any of these. And, we had to ask for blankets and towels (they only provided 3 - yes 3 total towels. Mostly we felt unsafe as anyone could have walked into the apartment at any time because the doors do not lock. Lastly, this place is in an interesting location. You obviously need a car. We drove in and had a problem trying to get the keys. The management company did not meet us at the front gate of the property- probably because they are not authorized to rent apartments in this complex. I had to ask directions and go to the apartment itself where they were waiting for me. I've lived in Morocco for years and speak the language but if any other tourist came, I don't know how they would find the apartment and get the keys. It all felt very shady and unprofessional. The apartment itself is nice.